I obtained some high end Acrylic by chance that is tough as nails and made some zero clearance throat plates out of it that are the same thickness as my factory plate. With my R4512 saw having the real thin throat plates, this stuff works out great. I’ve already made several in different angles for raised panel door work and such. It doesn’t sag or bend and the blade cut through it beautifully. I use some duct tape to hold down the edges. And, with a 4×8 sheet of it, I’ll make a bunch of spares. I thought I’d pass it along in case anybody with a R4512 is looking for a material that is the same thickness as their original throat plates. Good looking idea! It also brings safety to mind having that full view of the blade! Great idea, Eric. I made one and put in a little clearance and those thin pieces fly down there all the time. I should make one line this. I’m not sure what “High End” acrylic is, but I don’t share your enthusiasm. If it’s only 1/8” thick it is still pretty flimsy and I, personally, wouldn’t use it. Especially when cutting something small. Maybe use 1/4” polycarbonate (Lexan) and put a rabbet around the edge to make it flush would be a better option. My experience with acrylic, even 1/4”, suggests that it sags over time if held horizontally and is not supported on all edges. There is undoubtedly some width or length where that won’t happen, meaning smaller is less likely to significantly warp. I also don’t know what your material exactly is, but I hope it works. I would appreciate if you report back to us after using it a while. 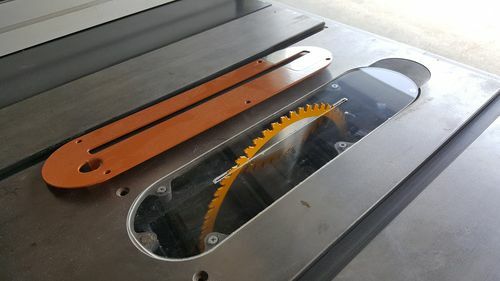 I have the same saw in La Conner, and constructing a ZCI is a problem. I made one out of hardboard, 1/8”, the “crappy stuff” with one side coated white, and reinforced it with glued on small pieces of wood, one like a keel, and another horizontal one on the short axis at the back. It works, but still flexes quite a bit. I use a sled for small items, so the flex is not too important. If you have any warp or flex issues, glue a well placed piece of acrylic or wood on the underside like a keel. If you do that, check the extremes of saw height to make sure it doesn’t interfere. There are some spots that can be used. Polycarbonate is tougher stuff, but I haven’t worked with it. My glasses are polycarbonate for lightness and toughness since they have minimal supporting elements, and my chair I am sitting on at this moment rolls around on a sheet of it for protection for the carpet….......otherwise, I know nothing about it. Warm up here in Anchorage, these days. I did way too many plumbing maintenance projects, and an electrical one as well, in La Conner, so I am resting my body and hands for a week…....staying out of the shop. Keep us informed. A good solution here would be welcomed by a bunch of us. Very cool. Gonna have to try that. If it sags There’s no reason why you can’t use acrylic cement to add supports under it for support. I agree with those questioning any “sag” particularly over time/temperature. 1/4” Polycarbonate is probably a better choice as it has greater impact resistance than acrylic. And you even painted it Home Depot Orange!! I have made quite a few of these for my Unisaw with opaque material, I like that you can screw yours down to get the level perfect and prevent it from catching and flying up at you.